Welcome to Celebrity Neighbor Drama, the first and potentially only entry in a series of Jezebel blog posts about famous people who are embroiled in public battles with the non-celebrities who live next door to them. 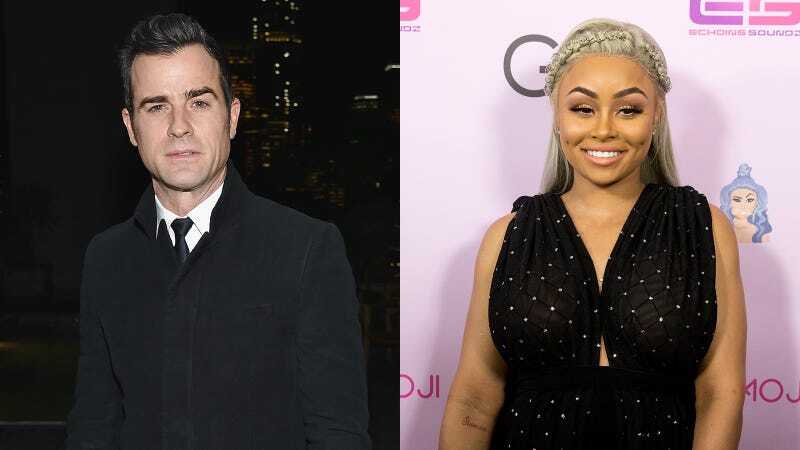 Some people—myself included—might think living next door to either Justin Theroux or Blac Chyna would be a lot of fun. With Justin, there’s a chance to casually wave hello at Jennifer Aniston when leaving for work, or to see Theroux wearing sweatpants or less as he runs outside to get the mail. Maybe you’ll really hit the jackpot and find out they don’t shut their bedroom curtains! Who knows. With Chyna next door, you’d have visits from Kardashians to look forward to, during which you could conceivably knock on her door and ask for a cup of flour/whether or not she accidentally got your copy of Out while scanning the rooms for Kim, Khloe, Kourtney, or Kris as they play with Dream. But maybe I’m wrong! TMZ reports Wednesday that both of these stars’ actual neighbors have learned that sharing a property line with a famous person isn’t all it’s cracked up to be [in my fantasies]. I’m going to end with Theroux. (Yep that sounds good.) In this case, he’s the one allegedly causing the trouble, and TMZ has the receipts. According to legal documents filed by Theroux’s downstairs neighbor, Norman Resnicow, the actor makes life in their NYC apartment building almost insufferable. Complaints include “endless barking from his rescue dogs left isolated for long periods, dropping heavy weights on the floor at 3 AM and angry outbursts.” Theroux reportedly refuses to pay for the more elaborate soundproofing Resnicow has requested. These new problems come just months after the same neighbor made headlines for threatening “to cut the actor’s water and electricity” over construction-related noise, after which Theroux filed a $350,000 harassment suit against him. Ugh. Neither of these are as good as the story about Minnie Driver, her mean neighbor, and the jars of paint. Meanwhile, I’m pretty there’s a vacancy in my dumb building if any A-list couples are looking for a neighbor who won’t complain about a damn thing.